The HH4240 is belt-driven and built for long continuous running hours on the toughest jobs. This machine is perfect for facility, fleet and property jobs that require extended cleaning times. External unloader with external bypass for fast and easy maintenance as well as increased pump protection. Dual braided MONSTER hose with polyurethane outer jacket that is non-marring and three times more abrasion resistant than rubber hose. Turbo nozzle delivers a faster and deeper clean with a powerful oscillating jet. Hustler pressure washers are built to the highest of standards, but our warranties provide extra peace of mind. See your local Hustler dealer for complete details. Non-marring and three times more abrasion resistant than a rubber hose. Three times more abrasion resistant than rubber while remaining lightweight and kink resistant. Creates a powerful jet of oscillating water. 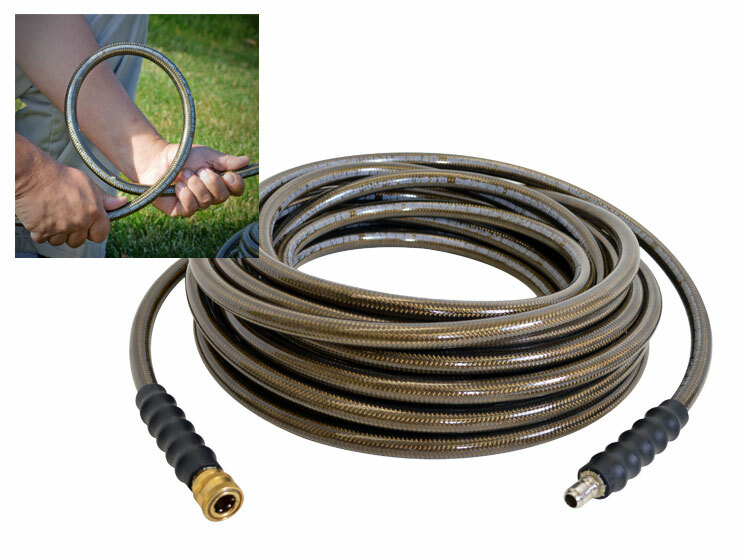 Universal to fit pressure washers with quick connect spray wands. Uniformly cleans large surfaces such as garage floors, driveways, patios and decks quickly. Equipped with in-line filter to prevent nozzle obstruction and pump damage. Pro-style ergonomic design with side assist grip and easy pull trigger for comfort and ease of use. Hot and cold water application capable. ¼” quick connect for easy attachment of spray tips and other accessories. Hustler® manufactures zero-turn mowers for the residential and commercial mower markets. We also produce an innovative utility vehicle product, released in 2017. Our strength, innovation and performance set the industry standard. Hustler® Turf – Engineering Performance.